Can you afford to replace your beloved? As musicians, we're known for creating frankly indecent bonds with our instruments. But have you ever considered what you would do if your beloved object was taken from you? Assuming you're not capable of a pan-European man-hunt resulting in a Liam Neeson-delivered smack down, it might be worth looking into instrument insurance. First and foremost, if you depend upon your instrument to help you earn your living then you should seriously consider taking out instrument insurance. If your gear is lost, damaged or stolen you need to minimise the amount of time you are without a quality instrument, which will likely cost you. This could include hiring replacements, paying for repairs or buying new - an insurance policy can cover all of these eventualities. In addition, those that travel and regularly perform with instruments are at extra risk: whether it's falling foul of nonchalant baggage handlers, rapidly changing temperatures and cabin pressures, or just carrying conspicuous valuable items in public places. You should also consider tailored instrument insurance if you're an amateur musician with a valuable and/or rare collection. Instrument insurers could have a better understanding of your needs due to the specialist nature of their work. For instance, if your 1959 Gibson Les Paul falls off its stand and splits its neck, there are policies available that would cover the resulting depreciation in the value of the instrument and the cost of its repair. Finally, there are some without vintage guitar collections who could also find it a savvy move, perhaps you aren't able to cover the cost of replacing your instrument outright, you share your household with pets and children, or even if you're just naturally accident prone. You might decide it's not worth considering separate instrument insurance if you don't gig or travel with your instruments regularly AND they're of low enough value that you can afford to replace them without skipping your rent. Between set-lists, stage times and wandering drummers, musicians have enough to worry about. Being insured can mean one less reason to stress. You'll be communicating with a firm that deals with musicians and their instruments all of the time, meaning you shouldn't have to spend an hour repeating 'Stratocaster' down the phone from Canada. The advantage of a specialist claims team is that they'll know which channels to notify of your missing gear, which may increase the chance of its return. Let's face it. Outside of a circle of spangly superstars that can afford to live a life free of insurance, most musicians lead fairly frugal lives. Another monthly direct debit may not be welcome or feasible. Some - but not all - providers will expect you to pay an excess amount (known in the US as the deductible), so you could find yourself having to stump up money from your own pocket when you claim. Fortunately, many instrument policies don't have an excess charge and it's usually quite low on those that do. Even if you take out instrument insurance, your provider may not cover the cause of your attempted claim. For instance, wear and tear, damage from damp/poor storage and confiscation by government agents are rarely covered. It's definitely worth doing your own research when looking for an instrument insurance policy. Plans can depend on a variety of different factors so you should take the time to find the one that is best suited to your needs. Some providers will offer different plans for different types of instrument. For example, one may cover amplification and electric guitars and another acoustic or orchestral instruments. You may need a more tailored package to cover a variety of gear. In addition, the cost of smaller accessories (tuners, effects pedals, cables, capos, slides) that you may not consider expensive individually also mounts up, so it could be worth ensuring these will be covered. Location is another important factor. Some policies will only cover you in your home country, while others - as is often the case with plans aimed at musicians - will extend worldwide. If you frequently travel long distance to new locations, be sure to check that you'll be covered wherever you go - not just on a country-by-country basis. 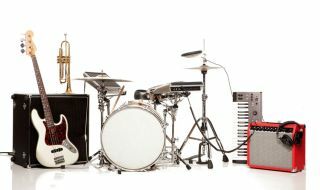 If you're not a frequent gigger, you don't travel internationally with your instrument and your gear is not particularly rare or high value (say below £2,000), it's definitely worth checking with your home contents insurer as sometimes you'll be able to specify items that you'd like covered away from home. The increase in your premium may be less than the cost of separate policy. Finally, if you're regularly playing public spaces (i.e. gigging) it may be worth considering public liability insurance for your band. Specialist music/instrument insurers offer this as protection against the cost of third party claims for damage to property or an individual. Basically, if you knock someone out with your microphone and they take you to court, this is the insurance you'll wish you had. We're not going to lie. It's tedious, but even the most watertight policies will have terms and conditions - breach them and you've been paying for nothing. Do you really need a 'bells and whistles' policy on a £350 guitar? Equally, can you really afford not to spend £30 a month insuring your £17,000 vintage 'retirement fund' instrument? An insurer should offer you the right package for your needs. Insurance is not a license to act without consideration. If you don't store, maintain and transport your instruments properly, you'll find it very difficult to claim for any damage caused - and to do so will likely breach your Ts and Cs. An annual service from a professional is also a good idea and could help support a claim. You usually need to notify insurers of any changes in your personal circumstances (e.g. address) and any change to your insured items. For instance, if you've bought/traded instruments, changed storage arrangements etc. Take the time to calculate the full value of your gear and the cost of replacing it like-for-like. It may be tempting to opt for a lower figure in the hope of keeping your premium down, but it's a false economy if you ever need to claim. Some insurers will require you to undertake an initial valuation of your instruments - particularly if they're high value items - but it's worth having them re-valued every three years to ensure you're not underinsured. Many policies require you to lock car doors and keep the instrument out of sight if it's stored in a vehicle. Be careful at venues, too, as again insurers may require locked doors or a guarded room before they agree to cover your gear. Aside from tipping the baggage handlers and avoiding playing any actual shows, the most effective thing you can do to protect your gear from damage on tour is invest in quality flight cases. Label everything with your band name and include your contact details (email, address, phone number). If you store gear at home then visible deterrents are always a good thing: burglar alarms, fences, gravel drives, loud dogs and vicious children could all play their part.